Ron Innamorato held two quarters above his head, said a silent prayer to the sea, and tossed them into the frothy water behind his boat. Then the 44-year-old, general contractor from Mullica Hill walked around the boat’s cockpit and rubbed his salt-and-pepper flattop on each of the 13 fishing rods that are dangling line into the dark blue waters. “Come on fish!,’ he yelled, breaking the silence of his rituals with a loud clap. The fish were not biting and by noon superstition became another tool to coax them into striking one of the many lures dangling like a spider web behind his boat, the 42-foot Tag N Brag. Things were promising early on Wednesday morning. After a four-hour, 80-mile boat ride in the pitch black night, Innamorato and his crew of seven arrived at the Spencer Canyon around 8:15 a.m. About 15 minutes later, a voice crackled over the CB radio, notifying the 143 boats that another day of the Mid-Atlantic $500,000 Tournament had begun. At 9 a.m., John Hall, a 23-year-old Southampton native, spotted seagulls circling over the sea from his perch, high above the boat on the tuna tower. Five minutes later, line goes screaming from one of the rods and the crew scrambles into order, with Len Mackie grabbing the pole first. “It’s a tuna right?’ said pilot Scott Jarvis, backing the boat up to ease the fight. “I don’t know yet,’ Mackie replied, cranking the reel’s handle. Since the tournament’s prize scale centers on the Blue and White Marlin, landing a tuna wasn’t a top priority, unless it was huge. Mackie, 36, usually does not reel in fish but the laws of the boat require the first person to touch the rod to reel it in. After about six minutes however, the crew is growing impatient. “If you would just work this fish a little harder we could go get some more,’ said Jarvis, laughing. As the fish nears the boat, Ron McQuaid Jr., leans far over the side, wrapping his gloved-hand around the strong leader attached to the hook. 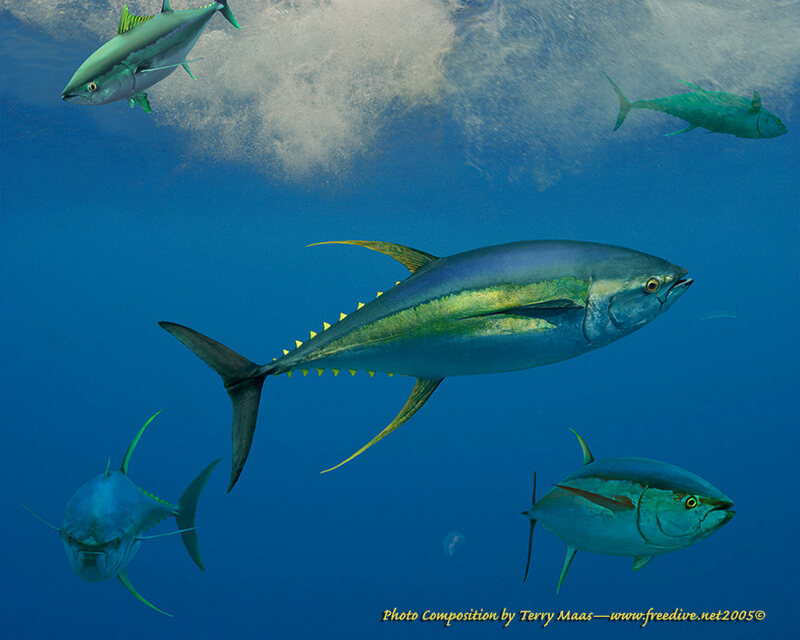 The fish, a Yellowfin Tuna, looks like a 70-pound, iridescent football with fins. When it sees the boat, the tuna makes a last ditch effort for freedom, pulling off almost half the line Mackie had already reeled in. After the tuna was boated, and tossed in to an icy well, the quest for Marlin continued. Tuna taste great and fight to the end, but a 70-pounder is not going to win any prize money this year and the crew knows it. Hours pass with no action and the crew attacks the boredom by joking on the CB to a rookie crew from Staten Island. Innamorato nicknamed the boat the Bump N Run due to a collision with a sea buoy in Beach Haven last week. Around 1 p.m., Innamorato’s 20-year-old daughter Christina cooked up massive cheeseburgers, which are readily devoured by the sun-soaked crew. Christina, a senior at Washington and Lee University in Virginia, is happy to cook, but she could handle any detail on the boat if needed. After lunch, whales are spotted surfacing in the distance. Whales could mean fish are near, and at the least, good luck. Nearly anything in the blue expanse, whether a patch of seaweed, a piece of wood, or a whale, is a cause for commotion, as it could mean trouble or big fish. Moments later, the prized Blue Marlin rears its regal head in the wake beneath the Tag N Brag, swatting its bill at a lure skipping along the surface. The crew is electrified, as the potential $500,000 fish rips the line of the reel. “It’s a Blue!,’ yells Ron McQuaid Jr., holding the rod. Innamorato, as he does for all big fish, takes his seat in the fighting chair and straps himself in for the battle. Just as quickly, the line stops running and goes slack. The elusive Blue is gone. Innamorato gets up from the wooden chair and spews a few curses into the sea, challenging the fish’s manhood for not sticking around for a fight. At 2:15 p.m. it’s getting down to crunch time as the day’s fishing ends in an hour. Tiny flying fish appear, popping in and out of the rolling waves — another sign of bigger fish. Like clockwork, three more fish, possibly White Marlin, hit the lures and fall off just as quickly. After superstitious Twizzlers are handed out, and another round of quarters and head rubbing, the day is over. On the ride home, another ritual fueled a mad dash toward the shore — karaoke at a local bar in downtown Cape May. Jarvis, a boat racer from Medford, cranked the throttle up to 25 knots, sending the Tag N Brag into six-foot waves while howling like a cowboy. While the day, to a novice, seemed unproductive, Innamorato feels primed and confident another trip would yield fish.